Ursuline Academy has offered a great opportunity for high school students to collaborate with elementary students during Academy Masses. The new program, called Mass Buddies, allows high school students to help kindergarten through second grade students understand the parts of a Mass. Mass Buddies began when I noticed that the elementary girls were a little confused about Mass and did not know exactly when to perform all of the appropriate movements, such as when to kneel, stand or the like. I brought this idea to Jessica Touchet, one of the high school religion teachers and club moderator for Peer Ministry. She then made this idea a reality and, before the next Mass, several high school students went and picked the girls up from their classrooms and they went to Mass together. 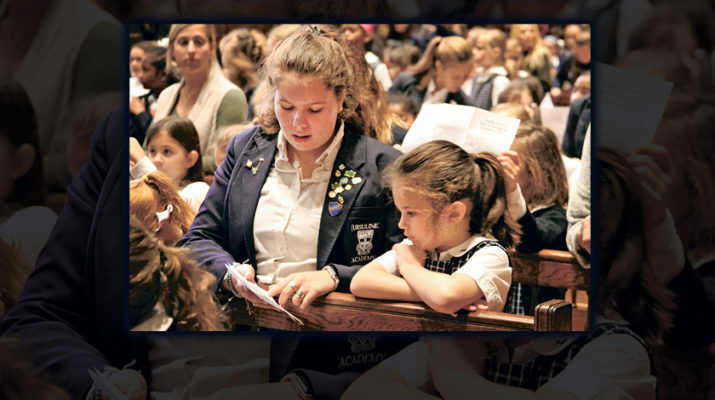 Both the high school and elementary girls love participating in Mass together and getting to know each other. First graders Molly Holloway and Malia Marigny say that their favorite thing about Mass Buddies is that “they get to have partners” and “know their names.” The elementary girls may only see the fun parts at first, but the high school students see so much more, like how it is unites our school. Senior Macallister Davis said she can really feel and see the difference the program is making. My hope for this program is that it will only grow and continue to unite our school in many ways through offering a unique experience of the Mass. Isabelle Giangrosso is a junior at Ursuline Academy in New Orleans. Catholic Community Radio is a 501(c)(3) media apostolate operating within the Archdiocese of New Orleans, The Diocese of Baton Rouge, and The Diocese of Houma-Thibodaux. We are dedicated to bringing the Gospel of Jesus Christ to terrestrial broadcasting and the digital continent.